What Type of Design do I Need? 1. Is it reasonable to assume there is a linear relationship between the factors and the response? If you answer "yes" to that question, a factorial design is probably a good choice. Remember, we use design of experiments because we want to learn as much as possible from the smallest amount of data. Our factors may not be linear if the levels are too far apart. 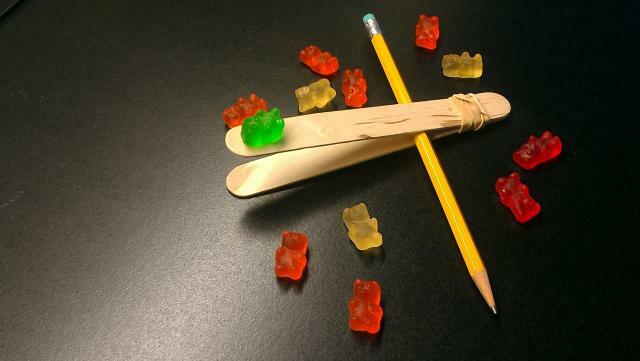 For example, changing the angle of the gummi bear catapult to the ground from 30 to 60 degrees might be linear, but from 30 to 160 probably would not. For now, though, a linear effect is still a safe assumption, which we can revisit after we choose the factor levels. Let's keep going. 2. Do any of my factors have to have more than 2 levels? If you answer "yes" to that question, stop and set up a general full factorial design in Minitab. For the gummi bear experiment, we could describe levels for all of the variables I planned to study with the words “high” and “low”: high angle, low angle, high position, low position, high number of windings, low number of windings, etcetera. But I might need to have more than two levels for some of those factors. Fortunately, design of experiments shows me how to check whether I need more levels before I collect data on the additional levels. Let's use the 2-level case and keep going without a general full factorial design. 3. Are any of my factors hard to change? If you answer "yes" to that question, stop and set up a split-plot design in Minitab. For the gummi bear experiment, the factors are not hard enough to change to demand a split-plot design. (By the time you’re unwinding a rubber band for the fifth or sixth time, you do start to wonder, though.) Let's keep going without a split-plot design. 4. Do I need to screen a large number of factors to identify the few most important factors? If you answer "yes" to that question, stop and set up a Plackett-Burman design in Minitab. Is it still okay to use a Plackett-Burman design? Sure it is. Just because there are only 5 factors doesn’t mean that all of them are important. However, there’s one thing we want to check in Minitab first. For designs with 2-7 factors, a Plackett-Burman design has to have at least 12 runs, but the regular factorial design can have 4 or 8 runs. To use design of experiments to check whether we need to collect data before we collect it, choose the design with the smallest amount of runs. The advantages of Plackett-Burman designs become more obvious with 8 or more factors. That means for our gummi bear experiment, we’re going to start with a plain old 2-level factorial design.